Do you know what “cream soda” is? It is a special drink that in my childhood I could only have when we went out to the town. There is a café right here in Kyoto that has, gasp! 24 kinds of melon soda, or as they are more commonly known, soda floats. This retro cuteness of this café Shin-Setsu is the reason for its popularity among women in Japan. Melon, mango, strawberry, are just some of the flavors they have available, and they are all cute and photogenic! Besides their soda floats, they also have piping hot pancakes served to you on hot metal plates and the cuteness of the place that makes it a favorite among women. How about trying the Japanese version of soda float, cream soda, here at Shin-Setsu? 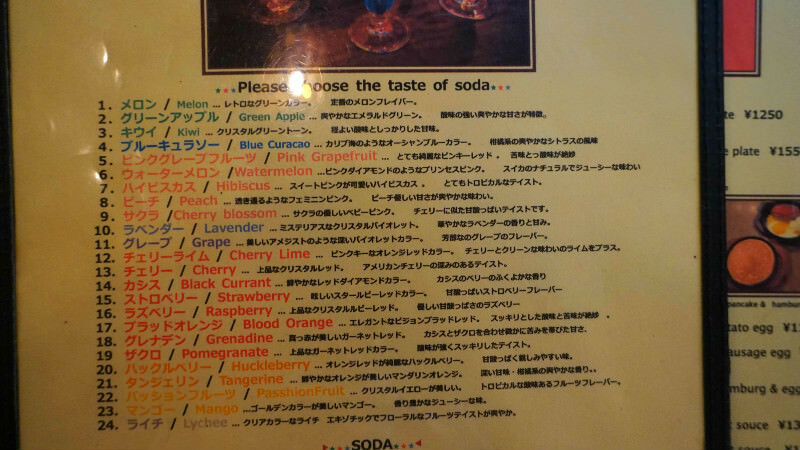 Here are the 24 different kinds of soda floats Shin-Setsu has! From left, the flavors are mango, melon, blue Curaçao liquor (non-alcoholic), pomegranate, and pink grapefruit. The way you can see through the ice in the vivid sodas is really pretty. The visual side of these sodas is absolutely gorgeous, and topped with a ball of ice cream and a cherry finishing it all! Shin-Setsu is also famous for their pancakes. You get the pancake brought to your table on a hot metal plate. You are surrounded by a sweet smell of the syrup that is poured on top of the pancake hits the hot plate below. This is my recommendation: the way the ice cream and syrup go with the pancake makes it even sweeter and more fragrant. They also have a set where you get a Hamburg steak and sausages with your pancake. This portion is quite big; you also get an egg and potato salad. These savory meats go surprisingly well with the sweet pancake, so this is my recommendation for those times when you are hungry. Here you can see the menu listing of the 24 kinds of soda floats. All of them, are really delicious, so you can also just choose the color you like! The five we ordered this time are the most colorful ones, so if you want one that looks great in pictures I recommend ordering one of the five I wrote about in the “Recommended” section. Everyone needs to order something. Shin-Setsu has a time limit of one hour per person. Shin-Setsu is a 5-minute walk from Hankyu Kawaramachi Station. The café is very small so you can’t go in with a stroller. They have a simple menu in English, and the staff is very friendly! I hope you will enjoy the soda floats, pancakes, and of course the cute interior of the café. Simple English, sometimes Korean, but notice that they don’t always have Korean-speaking staff present.